23 year old female from india with 3 weeks h/o red right eye.. Exam picture attached. What is the pathophysiology of this condition? What is the presumed etiology of teh underlying condition? What is the presumed etiology of the redness and inflammation? I agree with the broad differential that Sara stated. It looks like pingueculitis based on this image. The patient isn't risk of pinguecula based on her geographic location (increase UV light and dry air). Most pinguecula occur on the nasal side; it has been hypothesized that light going to the temporal cornea is partially blocked by the nose unlike light hitting the medial cornea. Lubrication and topical steroids for now. If the patient does develop recurrent issues with this you can excise it or laser photocoagulate which has a similar cosmetic outcome. Differential for this lesion can include pinguela/pingueculitis (usually caused by sunlight, wind, UV exposure), papilloma (in young people HSV, older people UV), lipoma or dermolipoma, granuloma (can be associated with multiple systemic conditions), CIN. The picture and vignette to me seem more consistent with inflamed pinguecula. The irritation can be caused by environmental exposure (dust, sunlight, wind, etc). 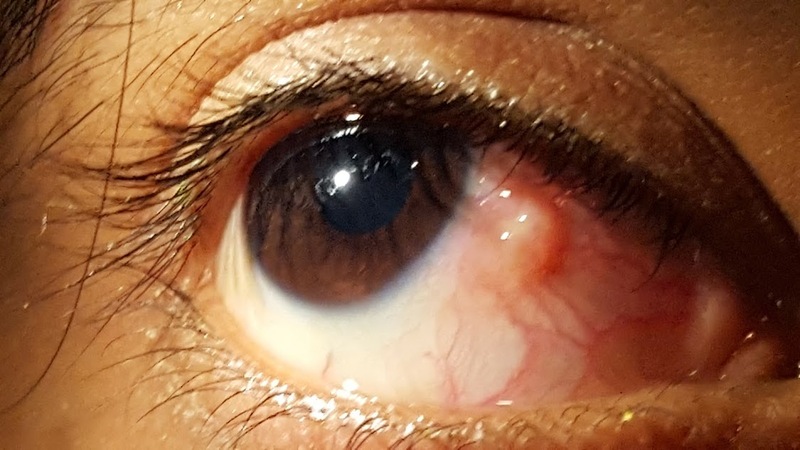 If the pinguecula becomes sufficiently inflamed/enlarged it can also prevent adequate lid closure which can further irritate the eye and cause exposure keratopathy. I think Audra's approach with lubrication and topical steroid would be appropriate. However, if this problem becomes recurrent, excision should be considered.